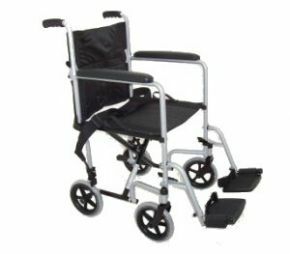 This lightweight folding transfer wheelchair is simple to operate and offers a good level of comfort and safety. It's very light (13kg or 28lb including footrests) and is available with or without a cushion. The lightness and simplicity of use mean that this one is an ideal wheelchair to have on standby at an airport or shopping centre, just in case a visitor needs a little extra help getting from A to B. Simple, light, but well-featured transfer wheelchairs like this one are also popular with care providers. The price is certainly right for those on a tight budget, and this is a practical chair that will suit many situations perfectly. It folds up neatly when not in use.